ANKARA (Reuters) - Turkish president-elect Tayyip Erdogan expects to announce his new prime minister as early as next Thursday following a meeting of his ruling AK Party's senior leadership, he told reporters late on Thursday. Speaking at a reception to mark the 13th anniversary of the founding of the AK Party, Erdogan said the party's central executive board would meet on Aug. 21, when the name of the new AKP chairman and future prime minister would be announced. The candidate would then need to be voted on by party members at a convention on August 27, but Erdogan's choice is unlikely to be challenged. Erdogan, who is due to be inaugurated on Aug. 28 after winning the country's first direct presidential election on Sunday, wants a staunch loyalist as prime minister who can hold the AK Party together and win a stronger parliamentary majority in a general election next year. 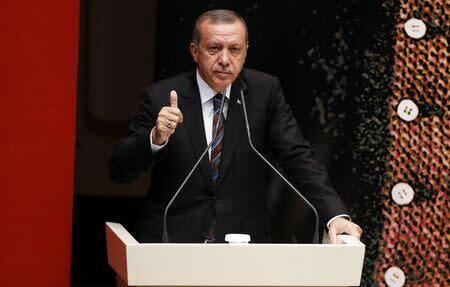 Erdogan, who steps down as prime minister and AK Party leader when he is sworn in as president, needs the continued support of an AKP with a strong majority to push through the constitutional change needed to introduce the presidential system he has long coveted for Turkey.